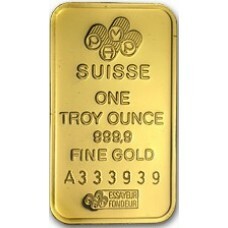 The one ounce gold bar is one of our most popular products. This bar is 99.99% pure and is extremely portable. See the picture below to see how beautiful this little bar really is. Let’s be honest. Gold is expensive, like, really expensive. A small amount of gold is worth a lot of money. If you have never handled it before, gold is also extremely heavy. The bars that you see in movies weigh over 27 pounds each! At $1,500 an ounce, these have a value of about $600,000 a piece. This is not practical to move, its virtually impossible to break into smaller denominations, and a lot of gold investors don’t even have $600,000 to put into a gold investment. Enter smaller denominations, in particular the one ounce bar (troy-ounces not standard ounces). Gold prices are always quoted in a per troy-ounce denomination. If you ask someone what the price of gold is, and they say $1,350 (about the current price of gold as of this writing), they mean per ounce. Our one ounce bars all have their weight engraved clearly on them, and a scale will easily measure their weight to be accurate. You can buy counterweights and a balance scale for a few dollars to prove it. If you are ever planning on exchanging physical gold for something of value, or if you can envision a scenario where you might need to, you will want to be able to exchange a quantity that is easily recognized and valued ubiquitously by people everywhere of all nations. Simply put gold is exchanged in per-ounce denominations, so if you plan on exchanging it you better have some ounces. While one ounce is a small quantity, it has a high value. If you want to easily transport gold having it broken up into troy-ounces is a great way to give you a lot of flexibility. You can carry small amounts if you only need a little, or a lot if you need more without sacrificing space. If you need to hide the fact that you are carrying a heavy metal you can easily disperse the individual ounces in ways that counterbalance, or even hide in the lining or secret compartment of a suitcase or bag. If you think you may need to transport your gold, its much easier to be able to disperse the weight as you want if its broken into small one ounce bars. We sell them because they are reliable. They are .9999 (99.99%) pure so you know you are getting extremely pure gold. They look great, they have a hallmark sheen that inspires people who view it. They are declared in good delivery by the Swiss National Bank and the London Bullion Market Association. They are one of the most commonly traded gold bars. Each has a unique serial number so you can verify authenticity. They can be held in a gold IRA. When you trade in gold you want it to be authentic, verifiable, widely accepted, and very reliable. Gold bars from the Swiss Bank are some of the most trusted gold bars on the planet. We only bring our customers the highest quality gold products with purity standards at the utmost level possible. If you are interested in purchasing our one ounce gold bars please contact us by phone or our contact form at the top. If you submit the form we will get back to you within one business day guaranteed.